Founded on a basis of Australian values including trust, value and honour. 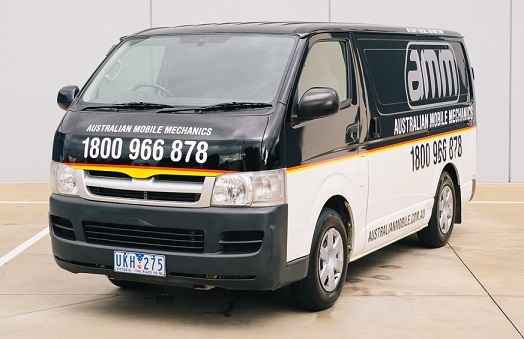 Australian Mobile Mechancics combines these with our extensive experience in the general repair and service field, to bring you the best package we can, right to your doorstep. What can't we do? Australian Mobile Mechanics takes pride in being a one stop solution for your passenger car/light commercial/4WD. But if there ever is any task we can't complete, we will let you know and assist with advice or direction, so we can still be a part of getting your car back on the road! Where can we carry out work? Most cars break down at home. From not starting on a cold morning, to having limped your car back home in the evening. Usually it will need repairs at your home. We can also carry out Log Book servicing to keep your warranty, right there in your driveway. For ultimate in convenience, we can carry out repairs and servicing at your workplace or anywhere safe nearby. Have your car ready when you go home, not having lost any time from your busy day! Yes! Australian Mobile Mechanics won't carry out any additional work on your vehicle without a written quote and agreement on price. We aim to eliminate nasty surprises at the end of a job. We strive to keep you informed and in control of the work we are carrying out. When do I pay? Can I pay later? Payment is required on completion of work of your vehicle. Are there discounts for seniors? Yes! We offer a 10% discount on labour for seniors (over 65 or with seniors card). To take advantage of this discount, simply discuss it with your mechanic when receiving a quote. I received a quote elsewhere, will you match it? We are always looking to provide you with the best value for a job, but if you have received a written quote elsewhere, contact us and we will always try and match or beat your quote. Tailoring our service to you is an important part of our company goals.